My new favorite toy for Twitter is one that you have to wonder why THEY didn't create- seriously this time. Slipstream gives me a reason to use the "NEW" Twitter interface as it only works in it right now. 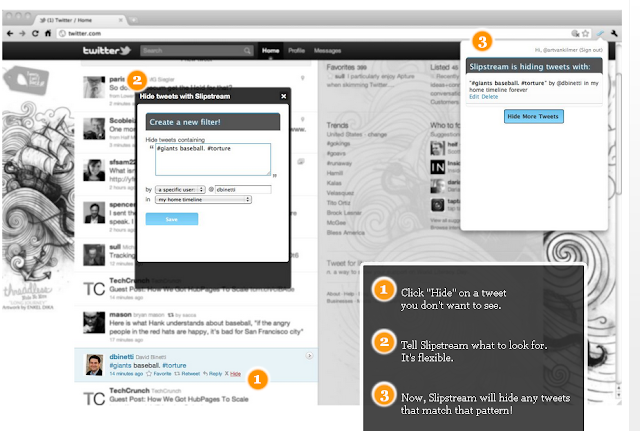 As you can see from the screenshot, it allows you to HIDE specific Tweets from people or based on keyword mentions. It will even let you determine where to block it. You can pick your lists, your home feed, you name it! So far, oneforty only has one review and it is neutral if not positive. You can find it in the Chrome Web Store and it was an easy download! The reviews there are positive as well! Slipstre.am from Arthur Klepchukov on Vimeo. You can see how it has changed from when it was being worked on last year, but after just messing around with it, I now have to stick with "new" Twitter to enjoy the benefit of Slipstream.